The supplement for menopausal women! Reduces hot flushes, headaches and other symptoms. The soybean was one of the 5 ancient Chinese 'sacred beans' and it has been one of their major crops since 300BC. Buddhist Missionaries introduced it to the Japanese, where it is now a major part of their diet. Investigation of the low incidence of menopausal symptoms and osteoporosis in Japanese women led to a link with soya consumption (the Japanese do not even have a word for hot flush). The health benefits have been attributed to the presence of 3 compounds, genistein, diadzein and glycitein, which belong to a group known as isoflavones. Men and women from the Far East consume 50-100mg of isoflavones a day on average. Menopause - research carried out on isoflavones as a natural alternative to hormone replacement therapy (HRT) has shown them to be effective in reducing hot flushes, headaches, irritability, vaginitis and vaginal dryness. Osteoporosis - it is thought that soya's weak oestrogenic effect helps prevent bone resorption (breakdown by the body) and thus promotes bone density. 90-100mg a day of isoflavones has been shown to be an effective dose. High cholesterol - a reduction in cholesterol levels has been demonstrated in men and women, due to soya's saponins binding to cholesterol in the intestines, limiting its absorption. Soya isoflavones also possess antioxidant activity. 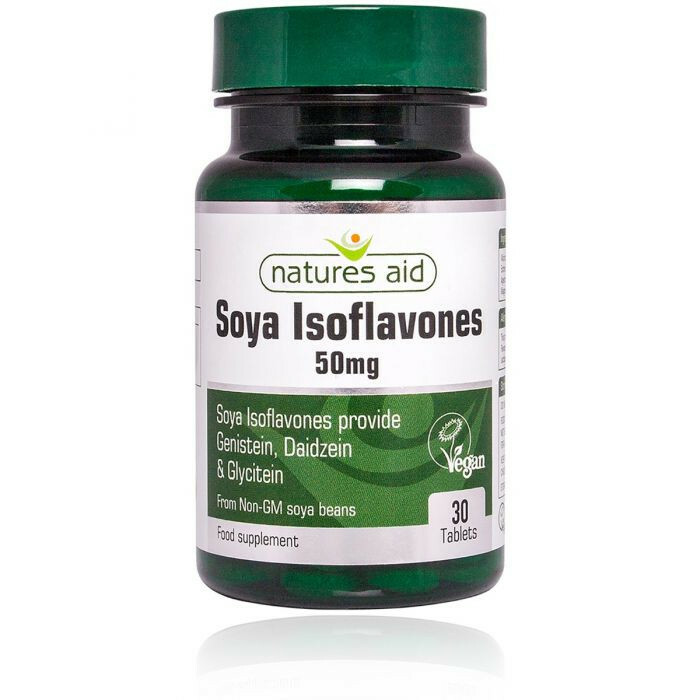 Natures Aid Soya Isoflavones are sourced from NON-GM soya beans.